Crystals are cool, okay? The end. Just kidding, I have more to say on this topic. Basically, it all really does boil down to "crystals are cool," but why is that? Why do we love the feeling of warm sand between our toes after swimming in the cold ocean water? What is the allure of massive stalactites and stalagmites that form in cool, damp caves deep underground? How many times have you collected a rock from a river bed that has been worn smooth by the powerful water? Is there any reaction besides awe when faced with enormous stone structures like Stonehenge or the Pyramids that were built with primitive tools? Who wouldn't be drawn to the rock sculpture that are formed by nature like, Canyonlands in Utah? As humans, we have a tendency to be fascinated by crystals, stones, rocks and minerals. And it's no wonder, as they formed in the bedrock of this planet we call home. In essence, they are the foundation of our being. Does that sound dramatic? Maybe. But I don't think it makes it less true. There are records of humans using crystals from 4000 BC, when then ancient Sumerians used stones and crystals based on their belief that they contained magical power. The ancient Egyptians used Lapis Lazuli to guide them to the afterlife as they believed it was connected to the spiritual "sight". This is similar to how many use it today, to open the third eye chakra and enhance psychic connection. They also used crystals such as Obsidian, Carnelian, Malachite and Turquoise. For over 5000 years, Jade has been used by people in China and India, as well as the Mayan and Aztec civilizations. There are over 200 mentions of crystals in the Bible. One notable example is the use of 12 crystals in the breastplate of the High Priest. The word crystal comes from the Greek words for "ice" and "drop" that was used to describe Clear Quartz which looked like ice and was extremely hard. Theophrastus (c. 371 – c. 287 BC) wrote a treatise called “On Stones” which classified crystals and rocks based on their behavior when heated, grouping them by common properties. It was followed by Pliny the Elder (23-79 AD) penning his “Natural History” in which he wrote a vast amount regarding the properties of minerals and stones. Isn't all of that so super cool? I love feeling connected to my ancestors. Don't you? Not only do crystals and minerals hold physical attributes that captivate us, they also star in their own legends, myths and magical lore. We use crystals in our technology and our homes. We wear crystals as symbols of love and friendship, and we pass them down as treasured heirlooms. We are the caretakers of these remarkable treasures of the earth. May they help us on our journey for generations to come. Share your crystal journey and experiences on the Mumbles & Things Facebook page. I respect your privacy and your inbox, by only send the stuff you really want. I find spammers and I curse them. 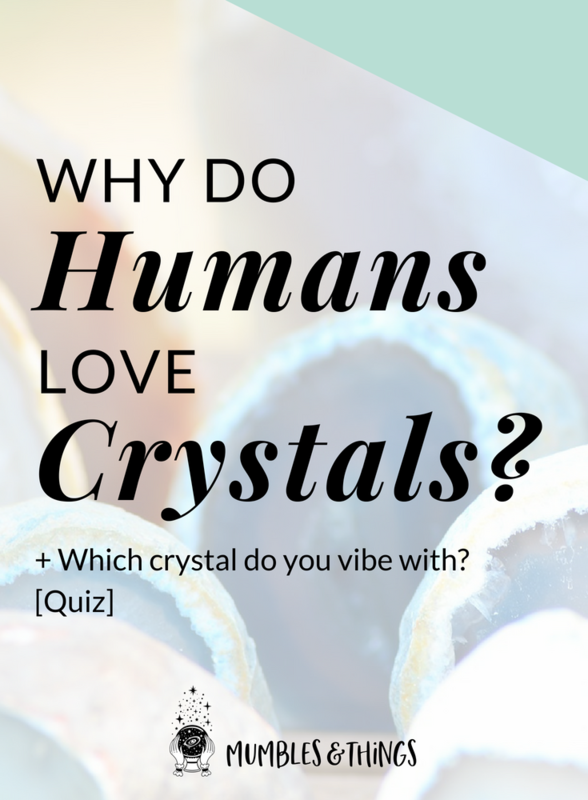 Why do you love crystals? Tell me below in the comments.